AMPE has made it publically known that they are up for sale and if someone doesn’t buy them or license the technology soon, they have the capability to proceed forward with the BLA and market the drug themselves. Ampio Pharmaceuticals, Inc. (AMPE) announced extended clinical trial results from the STRUT study that showed use of AmpionTM lowered the rate of Total Knee Replacement (TKR) surgery by almost 50% over the use of Saline. Although this study was preliminary in nature it’s results were statistically relevant which means that when the study is completed there is a very high likelihood the outcome will be the same on the larger subset of people. The impact of these results mean that AMPE can add to the list of current drug uses such as reducing pain, reducing inflammation, increasing function, and increasing global assessment. In addition, the company will be able to claim that the drug reduces TKR’s. This is a complete paradigm shift in the treatment of Osteoarthritis of the Knee (OAK) because now it’s viewed as a Disease Modifying Therapy (DMT). Top drug makers for OAK like Johnson and Johnson (NYSE: JNJ), Pfizer (NYSE: PFE), Teva Pharmaceuticals (NYSE: TEVA), and Purdue focus on reducing pain in this patient population through the use of opiates. Another tier of drug companies which include names like Sanofi Adventis (NYSE: SNY) and Flexion (NASDAQ: FLXN) have focused corticosteroids and hyaluronic acid. AmpionTM is a biologic which means it’s synthesized from human proteins and has no addictive properties like opiates and can be used over and over again. At the completion of this trial AMPE can include in their Biologics License Application (BLA) that use of AmpionTM will reduce the need for a TKR and up to 5 injections MUST be given before a TKR can be performed. The significance of this paradigm shift is that Orthopedic Surgeons will be required to give AmpionTM before a TKR is performed. The assumption that a large sales force will be needed to sell this drug is no longer valid for a DMT that becomes the new standard of care (SOC). The STRUT study was a randomized, saline vehicle-controlled study to evaluate the safety and efficacy of AmpionTM when administered as three 4 ml inter articular (IA) injections delivered every two weeks. The study involved a total of 47 patients which was done in 2 phases. Phase 1 was a 7 patient single blind phase where all patients received AmpionTM. Phase 2 was randomized on a 1:1 basis with AmpionTM vs Saline. The primary endpoint was change in WOMAC pain between baseline and week 20. Using an IRB approved protocol AMPE followed up with 39 of 45 patients that completed the study 3.5 years later using a telephone questionnaire. The number of severe or KL-4 patients that would need a TKR was 16. What this chart shows is a statistically significant change in the number of TKR’s performed when using AmpionTM. Using the most conservative results AmpionTM can reduce the number of TKR surgeries by close to 50%. If you combine the two groups the numbers are even more impressive with a 29.4% likelihood of a TKR vs an 83.3% using saline. Keep in mind this data point is 3.5 years after injection. This is the most compelling data ever presented in OAK and KL-4 patients and represents a DMT that should be the new SOC and first-line therapy. Right now the orthopedic market does conservatively 640,000 TKR’s per year. AMPE is seeking a label for up to 5 injections of AmpionTM as needed. Orthopedic surgeons might have had the opportunity to make a judgement call on performing a TKR surgery instead of using AmpionTM. The release of this new this new data statistically shows that AmpionTM should be the first-line treatment in KL-4 patients before attempting a TKR. Ultimately the FDA makes the decisions on this matter but standard governmental guidelines reveals that any first-line treatment that shows an improvement of 30% over the existing standard of care would likely get the first-line treatment designation. Should AMPE get first-line treatment designation, orthopedic surgeons would be required to use AmpionTM before attempting a TKR. This labeling designation could give AMPE the TKR market on a silver platter. When doctors see the effect of the drug on the most diseased patients, which is measured in weeks, it’s not hard to envision that use of the drug would be prescribed on less severe indications in place of prescribing opiates, corticosteroids and hyaluronic acid. Since doctors see patients at all stages of disease progression, this could be a real multiplier effect driving off label use of the drug. There are 3 types of treatment options for KL-4 patients which include Hyaluronic Acid, Corticosteriods, and Opioids. All these existing treatment options depicted in the chart below fell short in clinical trials in reducing pain and increasing functional improvement but the story doesn’t end there. Two major reports written by the Journal of American Medical Association (JAMA) and the American Academy of Orthopedic Surgeons (AAOS) which both state they “do not support use of triamcinolone’”, “we cannot recommend using hyaluronic acid.” With the exception of AmpionTM, all these drugs in the chart below are FDA approved in this indication even though they missed their endpoint in clinical trials. It’s clear that two nationally recognized associations believe that none of these drugs work and a solution is needed. If approved, AmpionTM will be the only drug that actually met its endpoints. 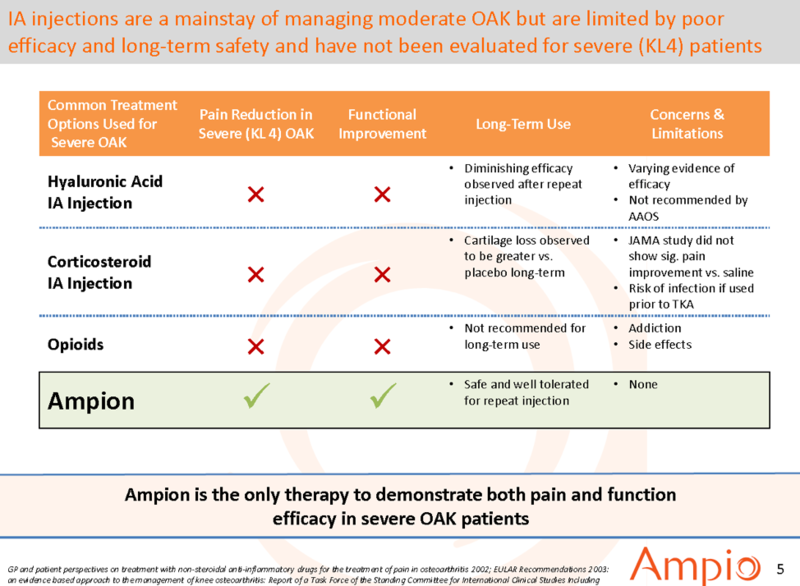 Major pharmaceuticals like Sanofi Adventis (NYSe: SNY), Johnson and Johnson (NYSE: JNJ), and Flexion (NASDAQ: FLXN) have failed to meet their endpoints in OAK but got marketing approval because there really aren’t any good options for patients until the advent of AMPE. None of these drugs work effectively long term and have proven to accelerate the disease progression. Injections do work for a short period but the mechanism of action is essentially taking a thin layer of cartilage and liquefying it to provide temporary relief. This isn’t a good long term solution. It is for this lack of a solution that state reimbursements are drying up for the top drug manufacturers. Another solution is needed and AMPE seems to have it. Current opiate pharmaceutical manufacturers like Johnson and Johnson (NYSE: JNJ), Pfizer (NYSE: PFE), and Teva Pharmaceuticals (NYSE: TEVA) have come under major political scrutiny for their role in creating the opioid epidemic. Last month Trump announced $13 billion to combat the opioid crisis. Big opiate manufacturers like Johnson and Johnson (NYSE: JNJ) are likely to view the purchase of AMPE as not only good publicity but also has the upside of owning a platform technology. Many of these companies if not all were at the JP Morgan (NYSE: JPM) Conference in January and could be in the process of submitting bids to buy AMPE because it would fix the existing political situation and fill the hole left by the drop in sales they have experienced from the inability to market their drugs. Investors might find that Merck (NYSE: MRK) is also an interesting suitor because it has not voiced plans to pursue its FORWARD trial which it completed in November 2017. MRK has made overtures that the Osteoarthritis Market needed disease modifying modalities that slow or reverse the progression of the disease. In an earlier release of data in the STRUT trial, AmpionTM demonstrated clinically significant cartilage growth of .02mm in as little as 3 months with one injection compared to MRK’s drug Sprifermin which had the same .02mm growth in healthier knees but took 2 years to get to that level. With 1 pivotal trial completed and another phase 3 trial that exceeded the endpoints the BLA has met the prerequisite requirements defined by the FDA AMPE can look forward to the labeling of the drug and eventually approval. The company has indicated on the latest conference call that they have enough money to complete the BLA and expect to have it done by Q3 if not sooner. It was also included as part of their budgeted burn rate which means they are working on it now. There are some great statistics in the pharmaceutical industry that break down the Likelihood of Approval (LOA) and the next milestone for this company is submitting the BLA license. Assuming they have the BLA done and have submitted the file to the FDA, investors can anticipate the probability of approval is 88.4% according to the Biotech Innovation Organization. The market should start factoring this probability into the stock price as time progresses but might need a catalyst. At times the market can be very inefficient at price discovery which could lead to huge swoons and falls in price in the presence of a catalyst. In the case of AMPE, the market disconnect from true valuation is more pronounced so it’s important to look at what factors are impeding true price discovery. The first factor is the markets fear of further dilution. The company did a couple of rounds of what was viewed as dilutive financing. The company stated on the last conference call that they had $11.2 million in cash, access to a credit facility, and over 5 million warrants in the money that have not yet been exercised. This translates into an $830,000 monthly burn rate with enough cash to take them through January 2019. The next factor deals with AMPE’s ability to get a licensing deal. The market is simply impatient and feels that if the drug is as good as claimed it shouldn’t take so long to get a licensing deal. The absence of a licensing deal announcement has put considerable pressure on the stock. Adding to the pressure is very high level of short interest in the stock with 13.1% of the float short. The stock is number 18 on the largest short position list. There are also “Fake News” reports weighing heavily on the stock price suggesting that AmpionTM is no better than saline playing on investor’s fears that drug approval is not likely. This negative sentiment is weighing heavily on stock price and the catalyst that could break this deadlock is a licensing deal as it puts to rest the issue of dilution and the ability to generate meaningful revenue. The net present value model risk adjusted is a summation of all the future earnings streams and discounted into today’s dollars. Valuations balloon in this model using even the most conservative numbers. Readers should notice the model uses a 9% probability of approval, which is typically the baseline for a New Drug Application (NDA). The profit per dose of $200 is based off the current retail price of Hyaluronic acid which ranges from $300 – $750 per injection. According to AMPE, the label will stipulate up to 5 injections per year which places the profit per patient at $1000 per year. 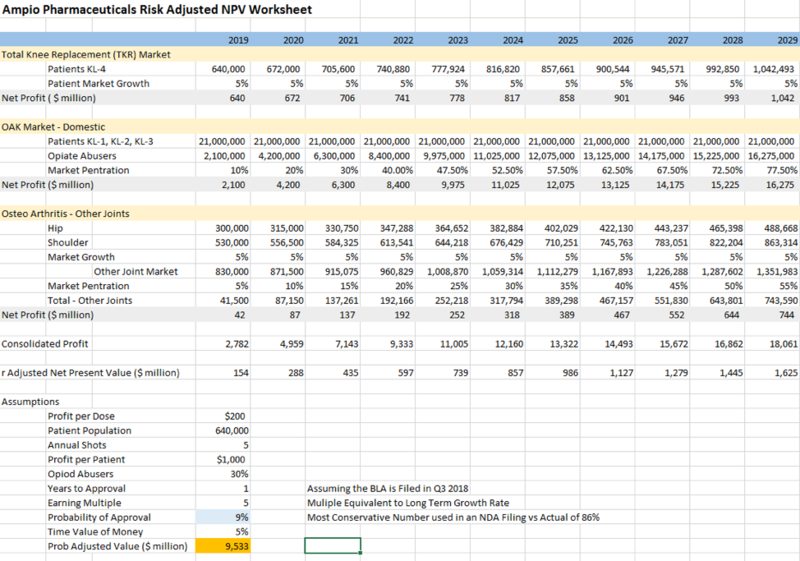 The current risk adjusted model places a $9.533 billion valuation on AMPE using these assumption. The probability of approval number should be 88.4% and if used in the model with ONLY KL-4 patients yields a risk adjusted value of $6.524 billion. Although no valuation report was made public, methodology would be the same and include more indication as this model does but with one major caveat. In all likelihood the model DID NOT include 100% market share of the KL-4 patients because that data was just released and the company had indicated the valuation was completed and in the 10 digits. This last trial data release was a major game changer in valuation because instead of having to build a sales force to achieve market penetration AMPE gets it on day 1 as this is likely to be a mandated first line therapy. Orthopedic surgeons should have no choice but to try it before they can do surgery. The model is extremely conservative and allows investors to throw out the opiate abusers and other joint surgeries and still and get a valuation in the billions. CEO Macaluso said an appraisal was done with figures in the “ten digit area” and expects the new appraisal with the expanded label will be “multiples” of that. This means the company has gone on record with a $2 billion plus appraisal yet the market capitalization sits at $200 million roughly 10% of its potential value according to the Company. Knowing the key milestones to look for is the key in investing in a stock with a large valuation gap. In the last two conference calls AMPE has made it publically known that they are up for sale and if someone doesn’t buy them or license the technology soon, they have the capability to proceed forward with the BLA and market the drug themselves. The last announcement of trial results made going at it alone a real possibility because mobilizing a large sales force which could bring dilution might not be necessary if AmpionTM is labeled as first-line treatment. Providers will be forced to order the drug for that condition and there are 640,000 TKR’s annually. The company is planning to file its 80,000 page BLA by Q3 and has recently indicated that it is 90% complete. That is a very large binary catalyst coming in the next 6 months which could push valuation and a repricing of the dilution risk and LOA risks. The other binary event is the outright purchase of the company and Big Pharma could accelerate their due diligence as the realization that the company is developing a go it alone strategy of licensing. There are a lot of moving parts to the overall picture when playing the valuation gap. If the company fails to achieve forward momentum in their drug development, and delays the filing of the BLA, the issue of dilution will creep back. Conversely if they land a licensing deal with significant size they can fund drug development without a partner avoiding the issue of dilution all together. The extended trial results just released by AMPE dramatically change the earnings model for the company. Before the trial results were announced earnings models assumed a progressive market penetration with a large salesforce over a number of years. The new statistically relevant data showed an over 50% reduction in TKR surgeries. Investors need to let this fact sink in to understand the magnitude. AmpionTM could become a first-line therapy in treating OAK and the new SOC which would require its use before attempting a TKR surgery. If this becomes the new protocol, it falls on the governing body, the AAOS, to spread the word on the use of AmpionTM. AMPE might not need to build a robust sales force to reap the benefits. AMPE is a very attractive buyout candidate for 3 reasons. The first is that it is a platform technology that will also work with other joints like the hip, shoulder, and elbow. The second reason is that the pipeline for new OAK drugs is dwindling due to the low reimbursement climate and only a new drug like AmpionTM can fix the issue. The third reason AMPE might get purchased boils down to politics as one of the big pharma drug makers might simply buy AMPE to show they are serious about repairing their image from the opioid litigation. The stock could be grossly undervalued based on the earnings model and currently has approximately a $200 million market capitalization. Further, the stock could have immediate upside of 5 – 10 times from the current market price as buyout speculation surfaces again. A possible catalyst might be a licensing deal to wake the market up to the numerous suitors that would want this prized technology.